Bright stars and new shows at the Einstein. The stars have gotten brighter at the National Air and Space Museum. The faraway galaxies have gotten sharper, the redshifts even redshiftier. Take one of the 233 seats in the completely revamped Albert Einstein Planetarium on the second floor of the National Mall building and you can see what a state-of-the-art system will do for viewing the universe. The planetarium was closed to the public for about two weeks in late March so it could get the biggest upgrade since the theater went digital in 2002. Carpeting and seats, which had been in use since the Museum opened in 1976, were ripped out and replaced. But the star of the renovation is the Definiti 8K Full Dome System, which projects ultra-high-definition images made with Sky-Skan software, including both produced movies and the star-field programs that in-person presenters use. 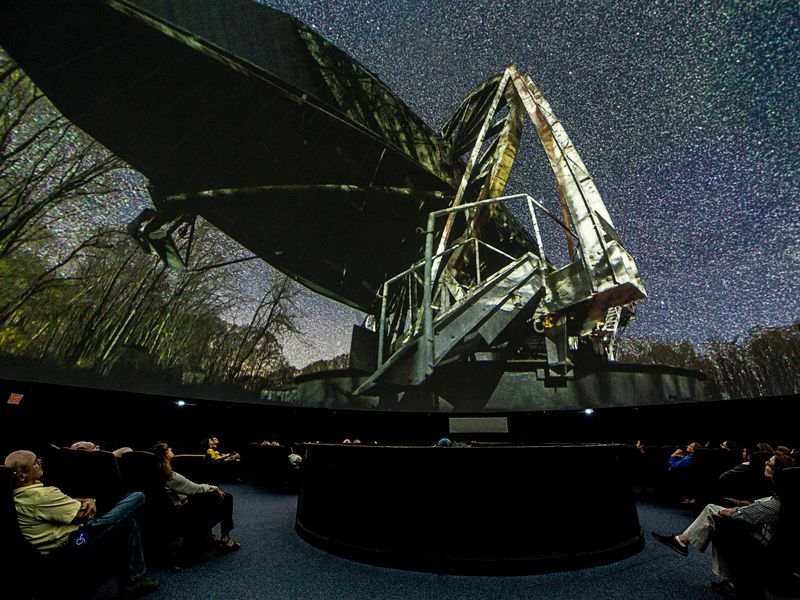 “Visitors to the National Air and Space Museum now have a unique opportunity to be transported by this experience, as this is the only planetarium on the east coast with this new type of system,” says Museum director General Jack Dailey. The previous projector (which will stay in place for some lo-fi shows) was the Zeiss VI, a classic bubble-shaped contraption that sits in the middle of the theater, spinning and twisting as it beams pictures up to the dome. The new system has six projectors spread out around the edge of the dome. The projected images stitch together perfectly on the dome screen, fooling the eye into seeing one continuous skyscape. “Our new installation is an exceptional advance in performance,” says Zarth Bertsch, Smithsonian’s director of theaters. “The resolution is approximately 16 times the resolution of HD [high definition], and the brightness, clarity, contrast, and color create an utterly stunning and immersive experience.” The Definiti system is a workhorse, playing at least 17 shows in the planetarium each day. The new projectors get so hot that there’s a small corridor built just behind the theater walls to keep the air cool and circulated. What does that mean for the audience? “The images just glisten,” says Karen Rice Gardiner, a marketing manager for Smithsonian. “It makes the dome seem higher and wider.” Museum guests will certainly notice a difference when going to see a current offering like Dark Universe. As galaxies form in the beginning of the universe, they become a subtle black and gray web of stars that benefits greatly from the projector’s sharp contrast. While narrarator Neil deGrasse Tyson describes the way light waves stretch as they travel through the universe, the dome seems to seize up as the redshifted beams pull the sky apart. But the best is yet to come, because Dark Universe, which has been on view at the Museum since April, isn’t optimized for the kind of resolution the Definiti 8K can handle. The system is so advanced that only a few films are available at top resolution, and one of them, To Space & Back, will premiere at the Einstein Planetarium late this month. The film showcases the myriad technologies astronomers and astronauts use to explore the universe, and how those engineering marvels are adapted to benefit life on Earth. One invention, a laser developed to study Earth’s atmosphere, is now used in surgery to clear blocked arteries. Come sit under the brighter, shinier stars at the Einstein Planetarium.